Sanjay Sardar is the vice president of analytics and simulation at SAIC. Prior to joining SAIC, Sardar served as chief information officer for the Federal Energy Regulatory Commission, where he was responsible for its strategic visioning, tactical leadership and operational management for all information technology. From 2002 to 2008, Sardar worked for General Dynamics as a senior program director. 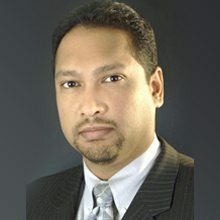 During his career, Sardar has also held managerial positions with DDLabs, Inc., Oracle Corp., and Platinum Technologies, Inc.
Sardar earned a Master of Business Administration degree from George Washington University, a Bachelor of Science degree from University of Virginia, and is currently working toward completing further executive education from Massachusetts Institute of Technology.